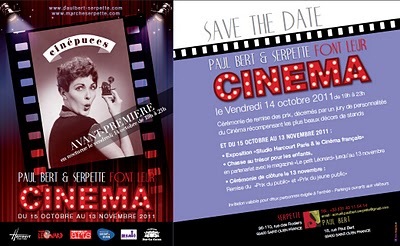 Majolica International Society: Special “Cinepuces” Event Friday - October 14, 7 p.m.
Special “Cinepuces” Event Friday - October 14, 7 p.m.
Aidjolate Antiquités, Laurence and Denis Vauclair are glad to invite you to the private soiree for the special “Cinepuces” event “Paul Bert & Serpette markets are making movies” on Friday October 14. from 7 p.m.
On this occasion, the French decorator Alain Tchilinguirian (Coco before Chanel, 2009) has decorated the Aidjolate stand in the style of the Visconti’s movie The Leopard. Second Empire style, winter garden, majolica and Palissy’s followers are magnified in this amazing decoration. Where? Marché Paul Bert, Allée 6, Stand 79.